Take it from me, moving across the country can be equally exciting and nerve wrecking. You're literally kicking off a brand new adventure, no matter the reason you're moving & mo matter how prepared you think you are. Personally, I never truly appreciated the differences in the two coasts till having moved from east to west; so I could 100% empathize with this client as she kicked off a move from Virginia to California. Already having had the floor plan for the new place, she reached out to me to start to work with her or creating her new west coast abode. She was going from living with roommates for years to having her own "bachelorette pad" and didn't want to have to guess every step along the way. She'd been collecting images on Pinterest for months, so after while prepping for our first session, she added me to her board & the wheels in my head started spinning with ideas. She made it very clear she wanted "lots of rose gold and grey!" as part of the design, and this was evident in the Pinterest board; however, as we started to flesh out the inspiration pics, I noticed her leaning more towards gold, while still favoring pink tones, and also a lot of cozy textures. I spy, with my little eye... HYGGE! Putting into words (and pictures) what she ultimately wanted for her space -- we were going to create a space that was full of charm & character, and felt inviting; while still having all the sass & swag of an L.A. bachelorette. While we initially planned to go with a grey sofa, with rose accents, a few steps into the design phase we decided to swap it out for a glam but casual velvet blush sofa, really making a statement piece that would be accented by neutrals. This would pair really nicely with the wood tones we wanted to use throughout the design! With the blush sofa serving as the statement piece in the space, layering in accent furniture & styling accessories was next! 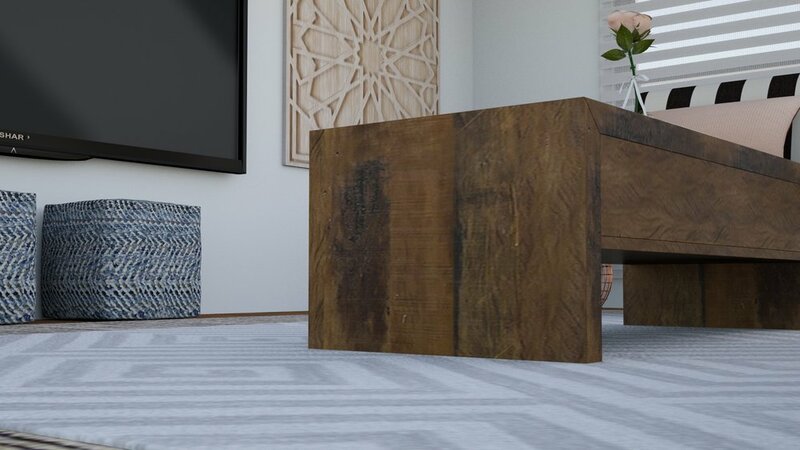 To really zone off and ground the living area, we layered 2 rugs -- a large natural area rug to define the space and a slightly smaller diamond motif area rug to add contrast to the larger rug, add visual interest, and anchor all the furnishings. This contrasting dance of natural materials and neutral textures would be carried throughout the entire design. 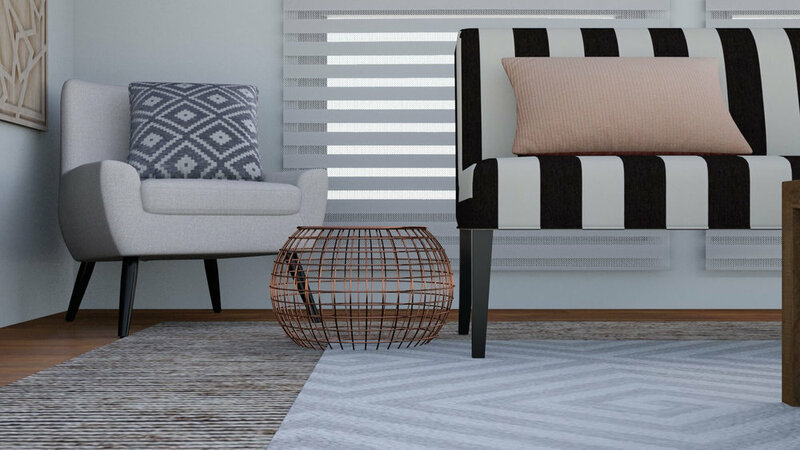 The armless black & white settee is a great whimsical but still chic compliment to the blush sofa, still keeping with the clean lines & simplistic silhouette used throughout the furnishings. The light grey accent chairs and acrylic console table allow the space to feel both soft & open, while the natural material and metal accents really added layers of cozy glam & subtle drama. The natural elements threaded throughout the entire design, not just the living room, are what really make the space feel warm, cozy, and lived in. The reclaimed wood cocktail table in pine is the PERF compliment to the dining table, really tying the two spaces together. This was a major concern for her -- making the open space all feel like one, while still having each area possess its own identity. The whitewashed wood wall art (say that 3x fast!) in all it's grandeur adds the right amount drama & artistic flair, while also creating a statement wall, framing out her large flatscreen. And lastly we have 2 large water hyacinth baskets tucked away for additional storage & decor, a perfect match to the foot stool made of banana fibers. Continuing the thread of natural, specifically wood finishes, in the space, I immediately fell in love with this pine wood statement dining table and knew it would be the perfect fit for this space and design. "parquet pattern adds unique geometric flair"
I can’t even say how obsessed I am with this gorgeous table, and not just because I love wood dining tables. From its raw yet refined pine finish, to the distinct ‘x’ inlays across the top, to its generous 106” length, this table begs to be the center of many a dinner party. While not a huge fan of sets, getting the coordinating bench from the collection was an absolute must for the table, rounding out the look with a mix of "ghost" side chairs and custom upholstered chairs. Also part of the collection was a sideboard, but I decided to go with something softer and more refined -- a beautiful white sideboard that featured turned lucite legs & a raise trellis front. The dining area would also feature subtle hints of blue, pulling from the blue chevron poufs in the living room. The blue & ivory area rug zoning off the dining area really brought a noticeable, yet classy pop into the space, in addition to a geometric design complimentary to that of the sideboard; while the blue/teal transparent glass lamps provided a very subtle hint. As is the case with most apartment rentals, the overhead lighting was underwhelming at best. So in addition to layering in lighting, we wanted to go ahead and replace the recessed lights that came with the place. Using a recessed lighting screw in conversion kit, the shade from an IKEA pendant, and a can of copper spray paint, we were able to create a very chic lighting presentation without breaking the walls or the bank! This upgrade was affordable & reversible, and it turned out to be one of the best things we could've done for the apartment! Additional touches came through in a small bar cart with casters for easy mobility (translation: libations in the living room!) and a very real looking but very faux fig tree in a small white ceramic planter. And we can't forget the tablescaping! Other areas of the apartment that got a bit of loving, while not as extensive, were the entry way and kitchen. 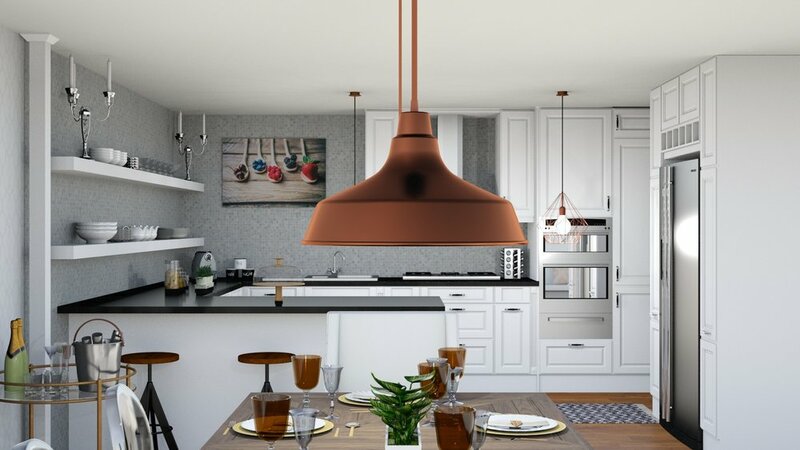 In the kitchen the biggest addition was another pair of screw in pendant lights & the same copper spray paint! From there, it was simply about additional styling on the shelves & introducing a natural chevron pattern blue runner, reminiscent of the rugs used in the living & dining areas. In the entry way, we wanted to keep it open and clutter free, super functional, but also pretty...like the rest of the apartment. We kept the look cohesive with a neutral palette, natural materials, and lots of texture. To date, this has got to be one of my most favorite redesigns -- while not really a challenging project, it was all the little aesthetic details and the thought put into it (not saying that my other projects aren't as meticulously thought out) that really made this one stand out to me. She handed me the virtual keys to her new home and let me have my way with it in a way that really resonated with my own personal aesthetic -- especially my new love of blush tones! In this redesign, we played with natural elements, different layers of texture, soft palettes, and mixed metals to create a design that I am ultimately in love with, but most importantly, that she's in love with.